O Antioch, my Antioch, my city! Queen of the East! my solace, my delight! Won back and made more wonderful by me! Hast thou seen Antioch the Beautiful? They shall have them all. Only to think of it!--Thou dost not laugh. Works slowly in this Israelitish dough! Thou hast done all this. And learn the lovely speech of Antioch. Where hast thou been to-day? Thou comest late. Than discus-playing with the common people. When they converse together at their games. And think that no one listens; what is that? Antiochus the Mad! Ay, that is it. Of a weird woman, like themselves insane. I like their courage, but it shall not save them. Or they shall die. Where are they? There in Samaria, and not trouble me. This pleases me, and furthers my designs. The occasion is auspicious. Bid them enter. SCENE II. -- ANTIOCHUS; JASON; THE SAMARITAN AMBASSADORS. As doth become Ambassadors. What seek ye? An audience from the King. Waste not the time in useless rhetoric. From the Sidonians, who live at Sichem." And do not tire thyself and me with bowing! "We are a colony of Medes and Persians." Ye are all Israelites, ye are all Jews. Your fields had not been planted in that year. Without a name, they offered sacrifice. The Temple of Jupiter Hellenius." But Greeks; if not by birth, yet Greeks by custom. Of Jupiter Hellenius. Ye may go! SCENE III. -- ANTIOCHUS; JASON. They were Sidonians, anything but Jews? Till the whole land is Hellenized. I know the stubborn nature of the Jew. By torture than to eat the flesh of swine. Shall bleed to death, or it shall change its faith! Hath raised the standard of revolt against thee. Shall be but furrows in a field of ashes. It shall be sown with salt as Sodom is! Where are those Seven Sons? They shall wait no longer! ACT II. The Dungeons in the Citadel. SCENE I. -- THE MOTHER of the SEVEN SONS alone, listening. Of earthen vessels broken at a well. Not your own selves, but his eternal law. And for the many sins of Israel. Hark! I can hear within the sound of scourges! I feel them more than ye do, O my sons! What wouldst thou ask of us? Transgress the law and customs of our fathers. Of dying first, as thou wast born the first. He in his servants shall be comforted. He is beyond all pain! Of thy whole body. Wilt thou eat then? It is Adaiah's voice. I tremble for him. And swift to change, gentle and yielding always. Be steadfast, O my son! The others will not shrink. Will give them back again. For the last time on earth, but not the last. To death it bids defiance and to torture. Seem unto me as naught, and less than naught. Before thee. I am waiting for the others. From God, to be raised up again by him. Rush to each other's arms. He will torment thee and thy seed. And hang my lifeless babes about my neck. Shall overtake thee and thy bloody house. One more, my Sirion, and then all is ended. I will lie down and sleep as sound as they. My Sirion, my youngest, best beloved! Slain in the shambles.--Not a sound I hear. That might escape the lips of one who dies. Art thou afraid? I do not hear thy voice. Die as thy brothers died. Thou must not live! How dost thou like this picture? By the recoil of his own wickedness? Wherefore art thou not dead, O Sirion? Among thy brothers dead? Art thou afraid? And be as we are; but he will not listen. And wouldst persuade him. I am sick of blood. Yea, I will speak with him and will persuade him. Again in mercy with them. Yea, I am laughed to scorn. That was by Moses given unto our fathers. Of the Almighty God, who seeth all things! He is no God of mine; I fear him not. That he alone is God. Here or hereafter, hath in store for me. My Sirion, I am proud of thee! Where lie so many sleepers, heartless mother! Thy children crying for thee in the night! All lying lifeless.--Kiss me, Sirion. ACT III. The Battle-field of Beth-horon. SCENE I. -- JUDAS MACCABAEUS in armor before his tent. Like that, before or after it, nor shall be. To thee, O Lord, among the gods!--Alas! Serve the designs of Him who giveth life. SCENE II -- JUDAS MACCABAEUS; JEWISH FUGITIVES. Steal in among our tents? From the polluted city, and from death. To die for Israel, and ye are welcome. And dally with harlots in the holy places. All this I knew before. To crown a drunken god. But tell me of the Jews. How fare the Jews? Is full of lamentation and of mourning. The beauty of the women hath been changed. And are there none to die for Israel? Lament for Israel; the men should die. With all her Seven Sons. The avenging wrath of God will track thee out! Whisper, or cry aloud, "The Help of God." SCENE III. -- JUDAS MACCABAEUS; NICANOR. With forehead unabashed. Thou art a spy sent by Nicanor. Behold my face; I am Nicanor's self. Thou art indeed Nicanor. I salute thee. Without the failings that attend those virtues. Canst righteous be and not intolerant. Is it to bow in silence to our victors? Polluted with strange gods? Are these things peace? Of peace to me, who am a fugitive? Unto his dust; his thought has come to nothing. To bring against all these? It is his day of rest. Blown through the windy streets. And come yourselves to me.--Farewell, Nicanor! SCENE IV. -- JUDAS MACCABAEUS; CAPTAINS AND SOLDIERS. The army of Nicanor comes against us. And fighting with your hands. How shall we fight against this multitude? Should do this thing, and flee away from them. Let us not stain our honor. Wilt thou fight on the Sabbath, Maccabaeus? I fight them on his day, as on all others. Upon the Seventh Day, and challenged them? Even to the number of a thousand souls? Lead us to the battle! And let our watchword be, "The Help of God!" Who holding up his hands prayed for the Jews. And with it thou shalt wound thine adversaries." And leave a memory of great deeds behind us. Didst slay a hundred fourscore and five thousand. Against thy holy people to blaspheme! ACT IV. The outer Courts of the Temple at Jerusalem. SCENE I. 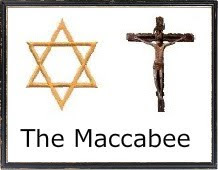 -- JUDAS MACCABAEUS; CAPTAINS; JEWS. Behold, our enemies are discomfited. Blackens in wind and sun. With images of heathen gods. Our beauty and our glory are laid waste! The Gentiles have profaned our holy p]aces! We sweep away his altars and his gods. I ask not who thou art. A priest of Satan. Traitor, thou art Jason. There hangs the head of one who was a Greek. Who born a Jew hath made himself a Greek? Thunders with all its thunder. Or even to any little child, shown mercy? To double wickedness, thine own and his. Gone with an army into the far East. It was a sign of triumph. Wherefore art thou not with him? For service in the Temple. Degrades us and deforms the things we do. Subservient to the will of other men. A witness of these solemn services. There can be nothing clean where thou art present. Nor sepulchre with thy fathers.--Get thee hence! SCENE III. -- JASON, alone. And pass into the inner courts. Alas! And set the loaves of showbread on the table. Upon his homeward journey, crowned with triumph. That had the slightest tone of comfort in it! ACT V. The Mountains of Ecbatana. SCENE I. -- ANTIOCHUS; PHILIP; ATTENDANTS. Here let us rest awhile. Where are we, Philip? And yonder mountain range is the Orontes. The Orontes is my river at Antioch. As if we were dead leaves, or desert sand. But what thou hadst not. To skip among these stones. That is not lost nor marred. The splendors of my court, my baths and banquets? Where are my players and my dancing women? That made me merry in the olden time? I am a laughing-stock to man and brute. Mock me and laugh at me. And my heart faileth me for very care. Stung by the Persian swarms of Elymais. Again to Antioch! When will that be? May the King live forever! Who art thou, and whence comest thou? Of something evil overshadows me. Even Lysias laughs at me!--Go on, go on. And took Jerusalem, the Holy City. And Maccabaeus marched to Carnion." Will rob me of my kingdom and my crown. And every home within its walls a tomb! The King is ill! What is it, O my Lord? Of an assassin smote me to the heart. 'T is passed, even as it came. Let us set forward. Weak as an infant. Ye will have to lead me. To live a little longer. Thou shalt not die; we will not let thee die! How canst thou help it, Philip? O the pain! Help me. I will release the Holy City. Garnish with goodly gifts the Holy Temple. Unto the citizens of Antioch. He faints. It is like death. In to the camp, while yet he lives. Into what tribulation am I come! I perish through great grief in a strange land. Wisheth them joy, prosperity, and health. more? I mean "Judas Maccabaeus, a Poem and a Play" is kinda boring. You might glance at Yahoo's home page and note how they create article headlines to grab people to open the links. You might try adding a video or a pic or two to get people excited about what you've got to say. Hi there, simply was alert to your blog thru Google, and found that it's truly informative. I'm gonna be careful for brussels. I will be grateful when you proceed this in future. Many people will be benefited from your writing. What's up, I desire to subscribe for this web site to get latest updates, thus where can i do it please help. in my diary every day. I'd like to start a blog so I will be able to share my personal experience and thoughts online. Please let me know if you have any kind of ideas or tips for new aspiring blog owners. Appreciate it!